California is suffering through one of the worst droughts in its history and some communities throughout the Central Valley have been devastated by its impacts. 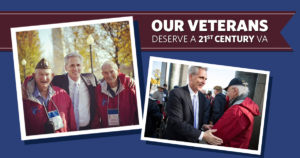 Veterans deserve a 21st century VA, which means increased choice and more accountability. Our work in the VA didn’t stop when the reform bill was signed into law. Americans want results. That’s why we should all be encouraged by the way we finished March. We accomplished two major goals and in so doing, set the tone for the remainder of this Congress.